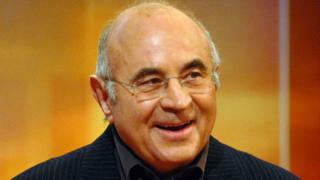 British actor Bob Hoskins, who was best known for roles in The Long Good Friday and Who Framed Roger Rabbit, has died of pneumonia at the age of 71. Hoskins' agent said he died on Tuesday in hospital, surrounded by family. The star won a Bafta and was Oscar-nominated in 1987 for crime drama Mona Lisa, in which he starred opposite Sir Michael Caine and Robbie Coltrane. He announced he was retiring from acting in 2012 after being diagnosed with Parkinson's disease. "We are devastated by the loss of our beloved Bob," added his wife Linda and children Alex, Sarah, Rosa and Jack said in a statement. "My darling Dad has died," Rosa Hoskins added on her website. "I loved him to the ends of the earth and he loved me back just the same." Sir Michael, who also appeared with Hoskins in the films Sweet Liberty and Last Orders, remembered him as "one of the nicest and best actors I have ever worked with". And Robert Zemeckis, the director of Who Framed Roger Rabbit, released a statement praising Hoskins for bringing "enjoyment to film audiences worldwide". He added: "As for his performance in Roger Rabbit, for all the special effects and technical wizardry, it was Bob's honesty and the truth of his performance that made the animated characters believable, and that was a testament to his real talent." Dame Helen Mirren, who played the wife of the gangster he portrayed in The Long Good Friday, also paid tribute, describing him as "a great actor and an even greater man" whose "inimitable energy... seemed like a spectacular firework rocket just as it takes off". "When I worked with him on his iconic film The Long Good Friday, he was supportive and unegotistic," she went on. "I had the honour of watching the creation of one of the most memorable characters of British film." Those sentiments were echoed by actor Timothy Spall, who said Hoskins was "an adored man and a deeply respected and admired actor [who] was able to make people laugh and cry". Hoskins, who was born in Suffolk but grew up in London, started out on the stage before embarking on a television and film career. On the small screen, he appeared in shows such as Play for Today, On the Move, Van der Valk and BBC drama The Street. On film, his credits also included Mermaids, Hook, Mrs Henderson Presents and Made in Dagenham. His last film role was as one of the dwarves in 2012's Snow White and the Huntsman, starring Kristen Stewart. Dame Judi Dench, who starred opposite Hoskins in Mrs Henderson Presents, told the BBC News website: "I'm so very sorry to hear this news, and am thinking of his family at this sad time." Hoskins was Bafta nominated twice prior to his Mona Lisa win, for The Honorary Consul in 1984 and The Long Good Friday in 1982. He was also nominated for a television Bafta for his role in Dennis Potter's BBC musical drama, Pennies from Heaven. UK film critic Jason Solomons called The Long Good Friday "a great Londoner's movie". "London ran through him like a stick of rock," he added. Tributes to the actor have appeared swiftly on Twitter, with Bafta saying it was "deeply saddened" to learn of his death. Actress Vicky McClure, who worked with Hoskins on Shane Meadows' 1999 film A Room for Romeo Brass, said: "He was one of the best. I feel honoured to have met & worked with him." Sherlock creator and actor Mark Gatiss, who appeared as Rat opposite Hoskins' Badger in a 2006 adaptation of The Wind in the Willows, tweeted a picture of the two together, praising Hoskins as "a true gent and an inspiration". Stephen Fry added: "That's awful news. The Long Good Friday [is] one of the best British movies of the modern era. A marvellous man."